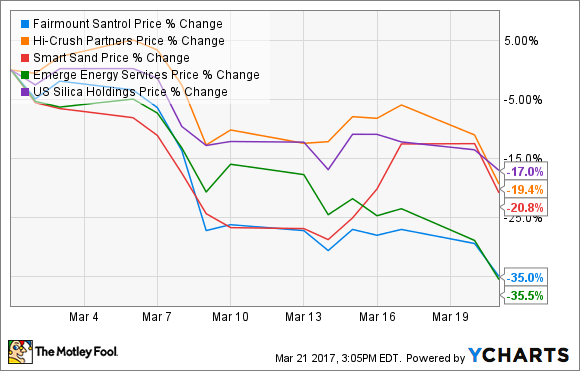 Hi-Crush Partners, Smart Sand, Fairmont Santrol, Emerge Energy Service, and U.S. Silica all fell sharply as crude oil prices hit a four-month low. 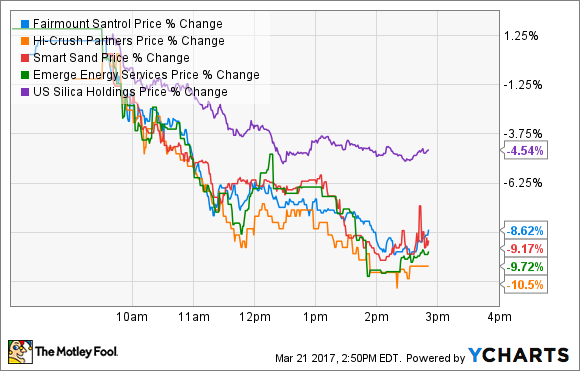 Slumping oil prices and some new competition appeared to be the driving forces behind the day's selloff. Crude closed down 1.4% today to $47.50 per barrel, a four-month low. Driving that decline was the continued market fear that oil inventories in the U.S. will keep building. In fact, analysts expect a government report due out this week to show a 2.6 million barrel stockpile increase. Making matters worse, the market doesn't believe that OPEC will extend its production cuts. If the cartel doesn't, that could keep a lid on oil prices for quite some time. Weaker crude oil prices would likely cause drillers to slow their plans, which has the potential to hold back volume growth for frack sand producers. Concerns about that scenario sparked a sell-off in Fairmont Santrol and other frack sand stocks earlier this month, as it would probably hold down prices for the material they supply. Meanwhile, in related news, oil-field service company Mammoth Energy Services (NASDAQ:TUSK) bought a frack sand mine today. While that mine currently produces 700,000 tons annually, Mammoth plans to invest $23 million to boost its output to 1.75 million tons by year's end. However, that expansion could prove problematic for the industry if frack sand demand falls off as a result of weaker oil prices, because it, along with other expansions, could cause a glut of sand to hit the market later this year. However, while many investors are bailing on frack sand producers, several analysts see this sell-off as a buying opportunity. Last week, for example, an analyst at Johnson Rice upgraded Smart Sand to buy and set a $21 price target, which is well above its current trading price of around $14.50. Before that, an analyst from Citi came out and said that the post-earnings sell-off in Fairmont Santol was a buying opportunity. While the analyst did lower the price target from $14 to $9, the analyst liked that Fairmont was willing to sacrifice market share in the quarter to become a first mover and increase prices. Meanwhile, earlier in the month Jefferies sang the praises of U.S. Silica and Hi-Crush Partners, which are its top two picks in the sector. While those bullish calls appear to have been early, they suggest that, at a minimum, today's sell-off should cause investors in search of a bargain to take a second look at these beaten-down frack sand stocks.